Best seen by high-flyers (literally): Mitchell River National Park, WA. The vast Kimberley region, with its remote beaches, colourful gorges and unusual waterfalls, is an area that spoils the average traveller for choice. So it’s best to have a plan of attack. Travel website Wotif.com has released itinerary suggestions aimed at a variety of Kimberley travellers, whether you want to explore by 4WD, dip your toe in the ocean, gaze down from the air, or experience the local culture and produce at one of the area’s year-round festivals. So, it’s time to choose your own adventure. If you enjoy a good road trip, or just want to take your time to explore the outback landscapes, try a serious four-wheel drive-adventure along the 660km Gibb River Road. Make sure you stop off at Purnululu Bungle Bungle Range and wander along the famous Domes Walk where you’ll find the remarkable striped sandstone domes. The Manning Gorge and Falls, the Pentecost River and El Questro Wilderness Park are a few other natural wonders you can visit along the way. If you’re keen to roam the lands but looking to do a shorter trip, swap the car seat for a camel’s hump and explore Cable Beach. With some of the Australia’s most pristine beaches to wander along and hundreds of fish species to swim beside, the Kimberley is ideal for travellers drawn to the coast. Explore Riddell Beach, between Broome’s Port and Gantheaume Point, during low tide and keep an eye out for dinosaur footprints. For a hidden gem visit West Beach at Cape Leveque and its striking red cliffs. If you want to get up close with the marine life, travel 300km west of Broome to Rowley Shoals and swim past giant clams and coral gardens. Keep an eye out for any signs that warn you not to swim, because many waterways here can be home to crocodiles. Flying high above the Kimberley is a great way to give context to its massive expanse. Going on a helicopter ride would have to be one of the best ways to explore some of the area’s largest icons, including Lake Argyle, one of Australia’s largest lakes, and the twin falls of King George,WA’s highest waterfall. 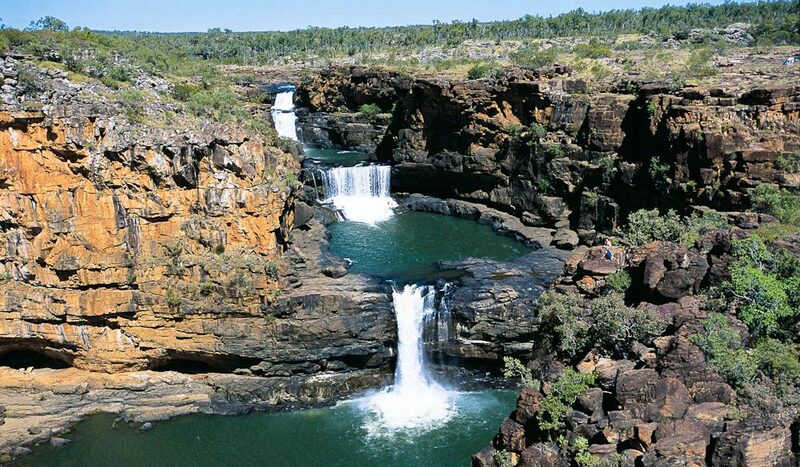 The Mitchell River National Park provides a striking mix of rainforest, river and tiered waterfall scenery. For a view of the horizontal falls at Talbot Bay, take a seaplane so you can see the tidal movement from above and up close when you land on the water. For the festival-goer or food and culture explorer, Broome has a range of events throughout the seasons. Soak up the atmosphere and sample the food at Broome’s Cable Beach Polo tournament in May. For a cultural experience, head to A Taste of Broome with history, music and cuisine all on display. For all things mango, sample the annual Broome Mango Festival at the end of November.